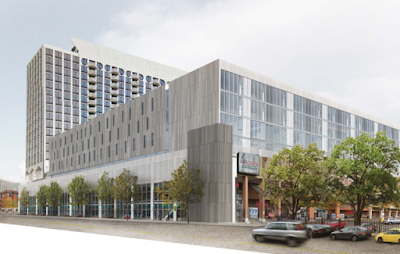 Expect to hear the pitter-patter of construction begin atop the Jewel and Uptown Fitness at Broadway and Montrose soon. Building permits were issued for Waterton's plans for adding a 4 story addition that includes 132 residential units. A total of 160 units are planned, so the permit for 28 townhomes has not been issued as of now. The Montrose corridor will be totally different in a year or two. = lots of new development. Let's have as big round of applause for James Cappleman. What an alderman can do Cappleman has done. No more dependable an alderman has exists or has existed in Chicago. The Luxurious expansion of housing no one who currently lives in Uptown can afford continues. I'm predicting 500 sq ft one bedrooms going for $2,000 a month once completed with a full affordabile housing buy out by the developer. And god knows we wouldn't want to attract new people into the area. Well, during the People's Republic of the 46th Ward under Comrade-Alderman Helen Shiller, the expectation was that NO restaurant, NO business, NO housing could locate in Uptown unless it catered only to the lowest common demoninator. The complaints we heard about places like Magnolia Cafe when they first opened--the audacity to charge more than $12 for an entree!! Fortunately, glasnost and perestroika arrived in Uptown, and, like the Eastern European former Soviet satellite countries, we now have an economy in our neighborhood that serves more than one socio-economic status. Personally, I like the diversity--it's fine with me if I have neighbors who pay more for rent--or mortgage--or dinner--than I do. No one is twisting MY arm to do it, and frankly, I'm tired of Uptown playing a typecast role of being the host to most of the subsidized housing and social services for the north side. Diversity is more than race, gender, sexual orientation, religion, or country of origin. And if you don't like ALL the diversity, don't let the door hit your backside on your way to a neighborhood with less of it. your definition of diversity it too diverse. In Shillerworld diversity can include all races, genders, ethnicities, sexual ID's, ages, etc as long as nearly all of those people are all or some of the following: super low income, low income, addicts, criminals or lawyers who like to sue police departments. There was also room for a few gentrified blocks in the NW corner of the ward where elected officials could live in quietude and relative calm. Your version of diversity is wrong implying that middle income or upper middle income people can live among the groups mentioned earlier. GENTRIFIER! HEATHEN! Male WITCH! Off to the gallows or the pyre for you. Seriously, let's just put Shiller behind us. She's dead politically. Now like Shakespeare's Caesar the evil that she did lives on beyond her political demise, but over a long period of time that will somewhat dissipate. Don't believe me? Step out of your door and find a clear view east towards Clarendon. See that crane in the sky? Smells like.........victory.